GRP Storage Tanks from 45 litres up to 90,000 litres in approved one piece tanks, available for storing many liquids (potable water, hot water, rainwater, chemicals, waste, grey water, sewage etc) and can be supplied with or without Insulation in a variety of sizes. All our tanks must be installed on a flat fully supporting base. One Piece Tanks for most standard applications and for tanks situated outside with no access restricitions. 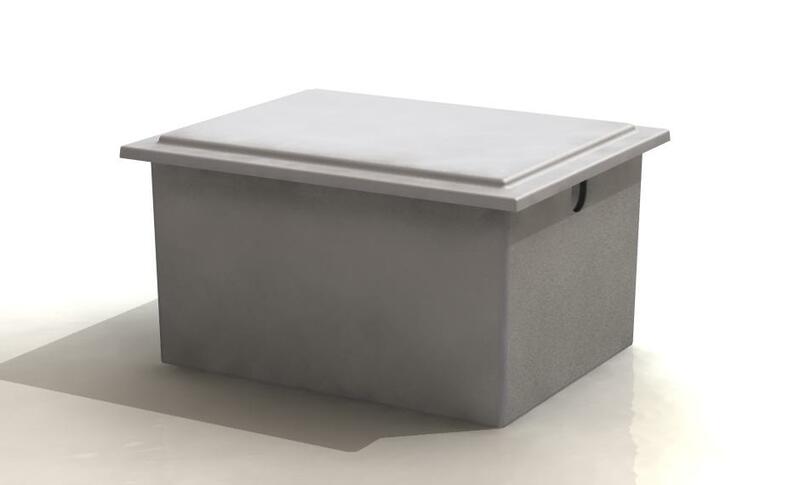 Fibreglass tanks with no internal supports or joints, with a smooth internal surface. can be produced in a variety of external colours, Our most economical style of tanks. One Piece Tanks can be manufactured plain or preinsulated, they have no internal supports or joints, with a smooth bacteria resistant internal surface, with external steel supports encapsulated within the walls of the tanks where required. One piece tanks can be manufactured using one of three different resins. No Internal Supports or Joints. Lids can be Apexed to cope with Rain/Snow loads if required. Insulated tanks available with HCFC Free Foam. Economical costs compared to Sectional Tanks. Two Piece Tanks with no internal supports, Designed for projects where access may have some restriction (eg. doorways), these tanks can be seperated in two halves along their height for access through doors and corridors, can be easily erected once in position. An economical alternative to standard Sectional panel tanks. Two Piece Tanks have been designed to provide a cost effective solution where a tank needs to go through a restricted access but also costs less than a full Sectional tank, These tanks are split along their height allowing them to be taken through doorways and down corridors and similar pathways, These tanks have a smooth internal surface and no internal supports. Smooth internal bacterial resistant surface. Cost effective solution to Sectional tanks. If a tank is required within an area that the capacity of the tank is far greater than the access into the area will allow requires a Sectional Tank. Made from GRP tank panels that can easily be moved into position and assembled into the tank by our team of specialists within the area. Sectional Tanks are available plain and preinsulated, and are constructed from a number of GRP panels that are bolted and sealed together on site, these tanks can be completely internally flanged only needing 50mm area around the tank to assemble, also tanks that are externally flanged with either internal or external flanged base,all sectionals come complete with sectional lid and Inspection hatch. Tanks upto 3m in Height with no restriction on Length and Width.